Was God the first Alexander Technique teacher? God. Was He the first teacher of the Alexander Technique? 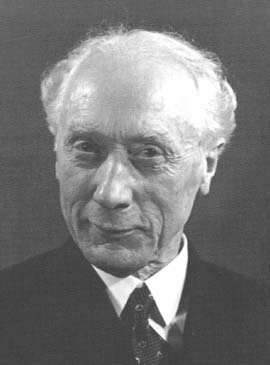 He doesn’t appear on any of the official teachers’ lists – but then neither does F. Matthias Alexander, developer of the Alexander Technique. Moses had been up on the mountain top for awhile receiving God’s commandments. The people had lost faith in his return – and in God. 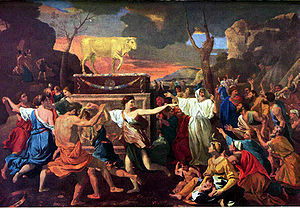 They built a golden calf to worship and began sacrificing animals to it. God had just led them out of Egypt, saved them from Pharoh’s army and provided for all their needs. Yet just a little delay in Moses’ return, and they reverted back to their old idol-worshiping ways. It’s not surprising that God was angry when He saw what they had done. But why did He use the phrase “stiffnecked people”? And why is that same phrase (the Hebrew word is kashe-oref – kashe: hard; oref: scruff of the neck) repeated again in Deuteronomy 9: 13 and 14 and several other places in the Bible? After all, God didn’t rail against their stiff shoulders, stiff arms or stiff legs. What’s so important about that particular part of our anatomy that God should make specific mention of it in His anger? Take a moment to think about where your neck is located and what function it plays in your life. Your neck is the vital connecting corridor between the most important parts of your body, your head and your torso. These are two parts of you that are absolutely necessary for you to survive as a living human being. A surgeon will tell you that there are as many distinct structures in your neck as in all the rest of your body. Air, food, nerve pathways and life-sustaining fluids such as blood and lymph have to pass through this narrow region of your body. And because the structures of your neck are packed so closely together, they require an absolute minimum of excess tension to function at their best. Clearly its important for your general well being that your neck freely allows what might be called efficient “biological connections” between your head and torso. But it’s condition also has a huge impact on the “mechanics” of your functioning: your posture, coordination and your ability to move efficiently. Your head weighs between 10-12 pounds and it is poised at the very top of your neck. I often hand my new Alexander Technique students a sack filled with 12 pounds of sugar and ask them to hold it in their arms for a few moments to get an idea of what this feels like. Most are amazed that they’re carrying so much weight on top of the necks. If your head is lightly balanced on top of your neck, very little muscular effort is needed to keep it there. But if that balance is compromised, you’re going to have to hold it up with a lot of muscular effort. In other words, you’ll have to stiffen your neck to keep it from falling forward, or to one side. And if your neck is stiffened, that tightness will cause compensatory tightening throughout the rest of your body, harming your ability to move freely and efficiently – not to mention restricting your breathing, putting pressure on your internal organs, etc. Think for a moment of people you know who have stiff necks. Watch how they sit, stand and move and you’ll see what I mean. Chances are they move comparatively stiffly and awkwardly. If we are indeed made in God’s image, then it stands to reason that He would be displeased when we would take poor care of ourselves. Stiffening our necks is one of the quickest and surest ways to do just that. And learning how to release undue tension in our necks – a major focus of Alexander Technique teaching – is one of the best things we can do to improve our overall functioning. So, back to the original question – was God the first Alexander Technique teacher? Sure, He recognized the importance of the state of humans’ necks, just as Alexander Technique teachers do today. And He did make an explicit connection between neck tension upright posture: In Micah 2, verse 3 He declares: I am planning such a misfortune against this clan that you will not be able to free your necks from it. You will not be able to walk erect. But I would argue that on balance He wasn’t such a great Alexander teacher. Threatening to destroy someone, or prevent them from walking upright, because they are tensing their necks is hardly going to encourage them to release that tension. You certainly don’t see Alexander Technique teachers today using this particular teaching procedure! We are more likely to suggest that our students gently direct themselves out of their harmful tension patterns, perhaps by using a phrase like “I am not stiffening my neck”. I think the best we can say about God’s teaching – if that’s in fact what he was trying to do – is that it was very much a work in progress. It was left to Alexander, and those who have followed him, to figure out how to teach people to effectively release the kind of tension that God was upset about. What do you think about God, stiff necks and the Alexander Technique? Do you know of similar references in the texts of other religions? I’d love to hear from you. Something to do with trading undoubtedly, but in keeping with all the stiff -necked stuff! Not sure of the provenance of this, but it kept my teaching lively for the day. What a great quote Alun! Let me know if/when you find the source. 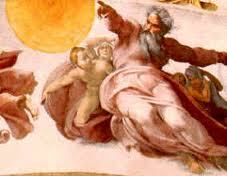 It’s a humorous question to ask if God was the first AT teacher. I think the answer depends on how one conceives of God, and how one conceives of AT. I think there are 19 or 20 references to stiff-necked in the Bible – mostly in the Old Testament, but some in the New. And as you said there are references to hardening the heart (the Pharoh, for example) and I believe “heart” usually is a reference to “head” or “body”. This is very good description, and i loved 2 sentences very much. 1. God is the first and the best alexander teacher. 2. F.m.alexander is the first and the best human alexander teacher. Actually neither of those quotes appears in the articles. Personally I don’t think either God or FM was the best teacher at all – certainly not God – unless His teaching role was to get the ball rolling so to speak and then outsource the details to us mere mortals. — and, may I also throw in there, the first mathematician? A very important post, Robert. Secondly, I really love when AT teachers can connect spiritual growth with bodymind learning. One needn’t believe in God to play with the idea in our work. “Stiff-necked” is a good description of being habitually on full alert, frozen and unable to respond in the moment. In the Old Testament it seems God wants us to obey rather than think for ourselves, which seems like the opposite of what Alexander work is all about. Until you consider that to “obey God” might just mean remaining open and flexible to whatever arises, or going with the flow, as we used to say back in the dark ages of the disco era. To follow God could mean to stay open to what Quakers call “continuing revelation,” or in Alexander parlance, “the means whereby” rather than the end one wishes to gain. Well, I could go on and on, but I won’t. This is a really interesting topic for consideration. Thanks for putting it out there. You’re correct of course – should have been He/She or something along those lines. Interesting point about what God actually wanted – did He/She want us to obey Him/Her or be flexibly in the moment? You’re right of course – I should have said He/She. I’m glad I came to read this a second time (a winding in if you like) and took comfort in relaxing my neck enough to read the comments. Perhaps the NT is all about continuing revelation (curiously the last book in it too)- the miracle of the present, inhibition, choice – forgiveness to turn around and around habitually if you so desire. The OT can be useful but its not my heritage…or is it? Since discovering AT I have had to steer off into Quantum Theory some Jung and Newton, movement and somatic practices just to keep the stream of questions alive more than anything. AT was my constant reference and reminded me to remember Tich Nat Hahn and stop using the dishwasher. If neck flexibility is a requisite to flow then punishment for bad behaviour aids the wave along, metaphorically speaking. I like the idea that G_d is Love and that finding out what Love means for us and then actioning is a big part of the journey. Church is all around when we look. I loved this post as well! Maybe it is nit for everyone, but personally I think it is great to ask this question, especially in such a nice and hunorous way as you do here. I have been thinking for a while of alle the words we have in our language that do describe bodily appearances, but that also have a deeper psychological meaning – like stiff-necked. A very interesting field, glad that you brought it up! (4) They running forward with necks outstretched, their heads uplifted, their gaze returning not towards them, and their hearts a (gaping) void! God was definitely the first Alexander technique teacher, but have you thought about that, that He was also the creator of the neck and the whole human being? Of course He knows exactly, how we should use our neck and our whole bodies – He has made us. And He also knows very well, how to communicate with us at any time or situation. When He finally decides to punish people for being stiff necked and with a hard heart, it usually comes after years, decades, sometimes even hundreds or thousands of years of trying to gently coax people towards the right decisions. Sadly it happens in this world, that people just won`t listen to gentle words. Sometimes people just won`t listen, before it really hurts. I probably wouldn`t have the patience to learn Alexander technique, if my body would hurt less than it does. Human beings tend to be lazy and not very interested in changing the way they think without a good reason. Pain can sometimes be that reason.